Scientists at Los Alamos National Laboratory have developed a computer model that clarifies the complex processes driving ocean mixing in the vast eddies that swirl across hundreds of miles of open ocean. "The model enables us to study the important processes of ocean storms, which move heat and carbon from the atmosphere into the deep ocean," said Todd Ringler, who leads the Accelerated Climate Model for Energy (ACME) ocean science team at Los Alamos. "This happens very slowly, but over the next 1,000 years, much of the fossil fuel carbon emissions will end up in the deep ocean; ocean eddies make that happen." The Lagrangian In-situ, Global, High-performance particle Tracking (LIGHT) model is a first-of-its-kind tool because of its ability to exploit the power available from today's supercomputers. Global climate simulations are beginning to be able to resolve the largest ocean eddies, called mesoscale eddies, which are considered the "weather" of the ocean. The model that the Laboratory researchers developed for ocean mixing leads to an improved understanding of these mesoscale eddies and how they mix the ocean waters. This information increases global climate simulation accuracy through a better representation of heat fluxes and carbon into the deep ocean. Eddies move heat, carbon, and other biogeochemical tracers from the ocean surface into the deep ocean and, as a result, store the carbon and heat away from the atmosphere. Transport and mixing regulates the global climate and the distribution of natural marine resources. The team's paper "Diagnosing isopycnal diffusivity in an eddying, idealized mid-latitude ocean basin via Lagrangian In-situ, Global, High-performance particle Tracking (LIGHT)," was recently published in the Journal of Physical Oceanography. The work will be released as part of the Model for Prediction Across Scales Ocean (MPAS-O), a core component of ACME. The MPAS-O is a global, multiscale, ocean code that simulates spatial and temporal scales ranging from coastal dynamics to basin-wide circulations. The primary application of MPAS-O is for the global ocean and its role in the evolution of global climate change. In their research, the team conducted ocean simulations with a massive number of particles spread evenly throughout the ocean; each particle is carried along with the ocean currents. "Not only does each particle tell us about the ocean currents, but groups of particles tell us how turbulence in the ocean mixes temperature and carbon dioxide throughout the ocean" said Phillip Wolfram, a postdoctoral researcher at the Laboratory and a member of the ACME science team. The results highlight the capability of LIGHT to compute the horizontal and vertical structure of diffusivity within the high-performance computing of MPAS-O, Wolfram said. "This project quantifies the key fundamental processes of the ocean and points the way to improved techniques to better simulate climate change over a range of spatial and temporal scales," Wolfram said. 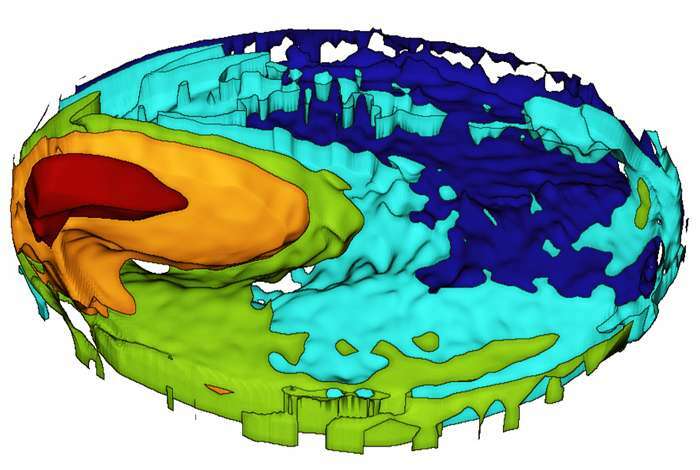 Just curious whether subsurface volcanoes are factored in as contributors of CO2, heat, currents, and mineral loading. I understand that much of the melting of the West Antarctic glaciers are the result of undersea volcanoes. They are factored in to the extent they can. However, that is difficult to do since we don't have capabilities for prediction of earth quakes or volcanoes. So, they go in depending on how the modelers are prepared to handle them. All numbers so far indicate that the changes in heat added or minerals. much of the melting of the West Antarctic glaciers are the result of undersea volcanoes. Do you have a reference for this? I have seen the opposite in that there can be some local melting that starts and stops. That has been going on for thousands of years so there is no reason to suspect that this has caused the recent changes in ice there. OK:..... geothermal flux of 200 mW/m^2 over the entire Thwaites catchment, and also that all of that heat goes into melting the overlying ice. The Thwaites catchment has an area of ~189,000 km^2. Water ice has a heat of fusion of 333.55 kJ/kg. A 200 mW (=0.2 J/s) flux is 6.3 MJ/yr (0.2*3600*24*365). That flux will, thus, melt 18.9 kg of ice/yr. Since the flux is distributed over a m^2, the melt rate will be 18.9 kg/m^2/yr, or 3.6 Gt/yr for the entire catchment. So, even assuming a geothermal flux almost 2x that in Schroeder, and that all of it melts ice, geothermal flux contributes, at most, 3.6/70=5.1% of Thwaites's meltwater, and probably much less.